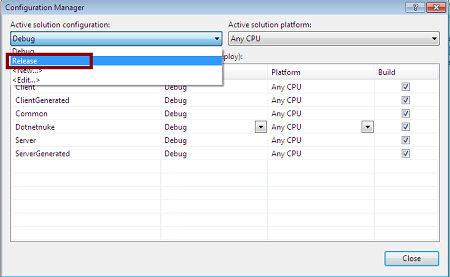 You can create a data alert to email notification in SQL Server 2012 reporting services. This data alert sends e-mail notification when only when specific conditions in the data are true at a schedule time. This Date Alerting feature is available only when reporting services runs in sharepoint integration mode. It works only with reports that are designed using Report Designer or Report Builder. You can not create alert for Power View reports. You can create one or more data alerts for any report provided report must return the data at the time you create the data alert. 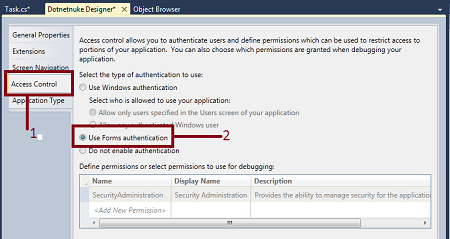 Note : You must have a permission in sharepoint to create an alert. Using Data Alert designer you can define rules for one or more data regions in the report that control reporting services send an alert. When you save the alerting definitions, reporting services saves it in the alerting database and schedules a corresponding SQL Server Agent Job. You can create one or more rules that compares a field value to value that you enter, Data Alert designer combines multiple rules for the same data feed by using logical AND operator. In schedule section of the Data Alert designer , you can configure the daily, weekly intervals at which to run the SQL Server Agent job for the data alert. Final, you must specify email address as a recipient for the data alert. Reporting services alert service manages the process of refreshing data feed and applying the rules in the data alert definition. Alerting service adds an alerting instance to the alerting database. If an error occurs during the alert processing then it sends an alert message to recipient describing the error message. Data Alert Manager lists all data alerts that you created for the report as shown below. To open the Data Alert Manager , Open the document library which has the report then click the down arrow and select Manage Data Alerts. With Windows Server 2012 (formerly “Windows Server 8”) on the horizon and many IT shops mulling upgrades, it’s more likely upgrades to Server 2012 will be incremental rather than all-at-once. It’s likely that those with infrastructure built on top of Windows Server will have both Server 2012 and older versions of Server running side-by-side for some time. Given that, here are a few answers to common questions in this area how the new and older versions of Windows Server might have coexistence issues. Can I run Windows Server 2012 systems in a cluster with earlier versions of Windows Server? The small answer is “no.” There are several reasons for this, not least of which are the major improvements in the way clustering is managed and deployed across servers in Windows Server 2012. The new clustering features aren’t backward-compatible with earlier versions of Windows Server, so clusters can’t be upgraded in a “rolling” fashion; each node in a cluster has to be evicted from the cluster, upgraded to Windows Server 2012 and added to a total new cluster of 2012-only servers. Storage migration . This allows cluster-managed VMs to be live-migrated to a new place while the VM is up and running, in much the same manner as VMware’s vMotion. Clustered shared volumes . This feature is not new to Server 2012 — it was introduced in Windows Server 2008 R2 — but it’s been revised and expanded, and the expanded functionality is not available for previous versions of Server. Multiple nodes in the same cluster can share the same file system, which allows a VM hosted on any node in that cluster to be migrated to any other node on that cluster. Cluster-aware updating (CAU) . Updates to machines in a Windows Server 2012 cluster can be applied automatically in a rolling fashion. This way, the total cluster remains online during the process. Plugins that talk to an API expand CAU’s behavior. There are many other new features, but to use them uniformly across a cluster requires a cluster-wide upgrade to Windows Server 2012. What do I need to know in this area using file shares between Windows Server 2012 and earlier versions of Windows Server? Windows Server 2012 uses the new SMB 3.0 protocol (originally SMB 2.2) for establishing file shares between Windows systems. SMB 3.0 clients will always attempt to negotiate the highest possible level of the protocol with any peer it connects with, so if you establish a share between Windows Server 2012 and earlier versions of Windows Server, the connection will be negotiated according to whatever level of SMB is available on the other server. Microsoft TechNet blogger Jose Barreto has a post with a chart that spells out the highest grade of SMB available to a connection negotiated between any two editions of Windows. Scale-out. The same folder can be shared from multiple nodes in a cluster for the sake of failover, surpass use of bandwidth, dynamic capacity scaling, load balancing and fault tolerance. Multichannel help. Any multiple, redundant network associations between SMB peers can be used to accelerate the connection. End-to-end encryption. Data sent between SMB 3.0 peers is encrypted by default. VSS help. SMB shares are now covered by volume shadow copies as well, so data on file shares can also be backed up and restored owing to any VSS-aware software. SMB Direct. Servers that use RDMA-capable network adapters can delight in high-speed memory-to-memory data transfers with far less CPU usage and latency than conventional copy operations. SMB index leasing. This feature reduces latency for documents accessed via the Branch Cache feature, by locally caching more of the metadata associated with the document and reducing the amount of roundtrips to the original server. Note that if you have a mixed infrastructure where all the clients and servers use SMB 2 or surpass — Windows Vista on the client side, Windows Server 2008 on the server side — disable the use of SMB 1.x with the PowerShell command Set-SmbServerConfiguration –EnableSMB1Protocol $fake. Disabling SMB 1.x reduces the potential attack surface for the server. If the protocol isn’t in use, it’s best to disable it to preclude a possible future exploit from being used on it. 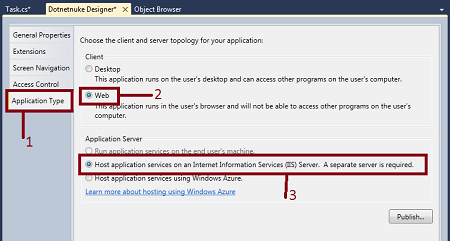 What Windows Server features are being deprecated in Windows Server 2012? Some features in Windows Server are no longer supported as of Windows Server 2012, or are in the process of being removed. Most of these deprecations only occupy code or applications that run directly on the new OS, rather than interoperations with other editions. That said, there are exceptions especially if, for instance, you have an older application that expects the same behavior when it tries to interoperate with the newer version of Server. Clustering. 32-bit cluster resource DLLs are being deprecated and must be replaced with their 64-bit counterparts whenever possible. Also, if you have any programs that use the Cluster Automation Server (MSClus) COM API, be aware that this API is now only available via an optional component named FailoverCluster-AutomationServer, which isn’t installed by default. Databases. 16- and 32-bit ODBC help has been removed, as have ODBC and OLEDB drivers for Oracle and Jet Red databases. (Use vendor-supplied database connectors.) ODBC/OLEDB help is also being canned for any versions of SQL Server beyond 2000; for those editions of SQL Server and higher, use SQL Native Client instead. Finally, no version of SQL Server earlier than 7.0 is supported at all. 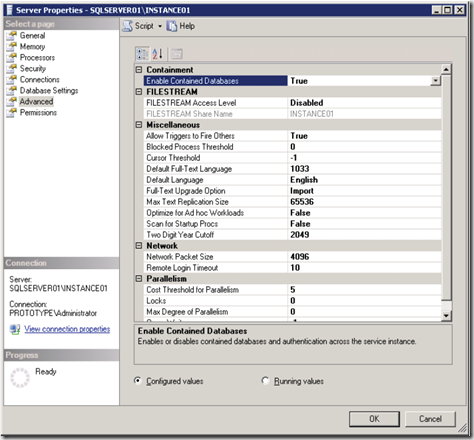 It’s unlikely that anyone is still running SQL Server 6.5 or earlier, but any attempts to connect to a SQL Server 6.5 (or earlier) instance from Windows Server 2012 will breed an error. Committed Index. Help for resource groups and using Committed Index Lightweight Index Services as an certification store have been deprecated. UNIX. Many UNIX subsystem features are being deprecated or removed. Microsoft entire SUA POSIX subsystem is being deprecated, along with the line printer daemon protocol that is often used by UNIX clients. As a general replacement for Microsoft’s UNIX features consider using the Cygwin or MinGW, open source tools and APIs that are maintained entirely apart from Windows’s own evolution. WMI. Many individual WMI providers are being removed or deprecated: SNMP (because SNMP itself is deprecated); the WMI provider for Committed Index (eclipsed by PowerShell), and the Win32_ServerFeature API. If you ever had the need to add a clear / reset button to your standard SQL Server Reporting Services report viewer, here’s a way to do it. 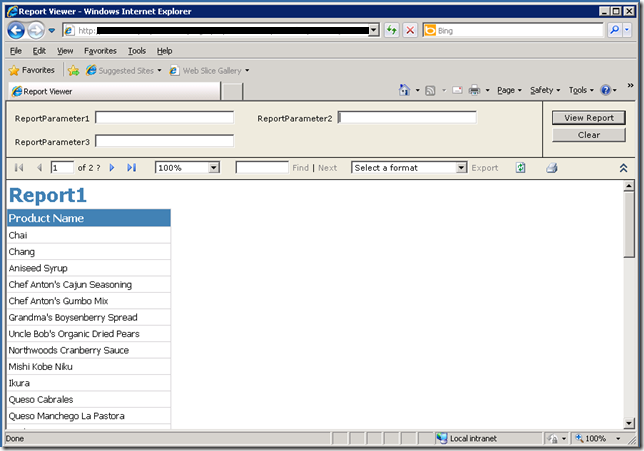 Normally when reports are displayed, they are piped through the ReportViewer.aspx page that comes with SSRS. This page hosts the Reporting Server host component, and adds text boxes, radio buttton etc. based on the number of parameters you have in your report. You can’t simply replace this file with your own custom page, because SSRS has HTTP handlers installed that prevents any other file to be rendered except the ReportViewer.aspx page. Essentially, we just need to find the container that holds the View Report button, and add our custom button. Visual Studio LightSwitch is a Microsoft tool used for building business applications. 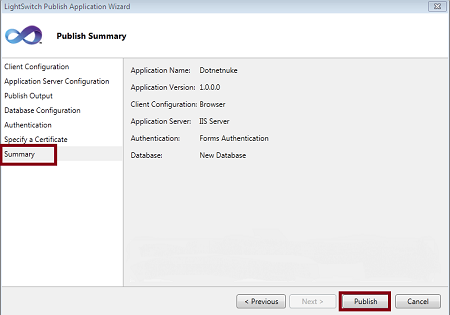 If you want your LightSwitch application to be deployed as a DotNetNuke then you can. Before deploying yourLightSwitch applications inDotNetNuke you will need at least DotNetNuke 5 (using ASP.NET 4.0). Or you can use the newest DotNetNuke 6. 1. 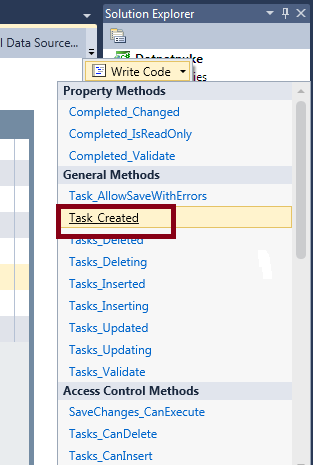 Open Visual Studio LightSwitch->Create new table. 2. Create a table such as Task. 3. Then, right click on Screen à Add Screen. 4. 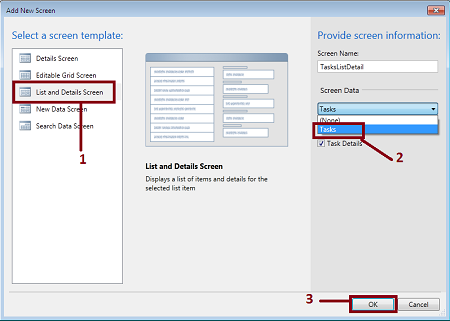 Select list and details screen->Select screen data (Task)->Ok. 5. 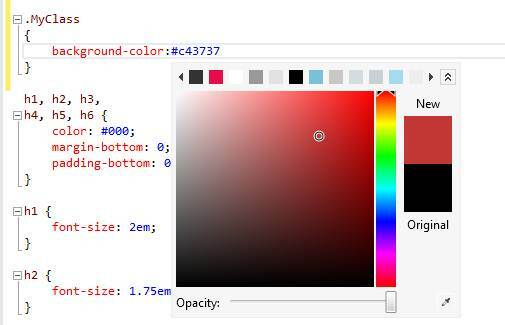 Click on write code à Select Task_Created. Description : This code set the Username field to the "Application.User.Name". 6. 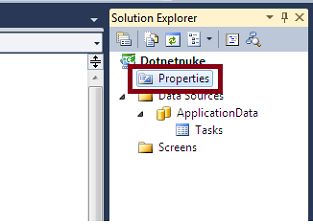 Go to properties in the Solution Explorer. 9. Go to configuration manager in debug. 10. Select release mode in debug. 11. Go to build in menu bar->Publish your application (DotNetNuke). 12. Click on publish for publish your application. 13. Run your application (Press F5).